Note : Your request will be directed to KeyLink Microwave. The KB0842S50A from Keylink Microwave is a rack-mountable power amplifier that operates from 0.8 to 4.2 GHz. 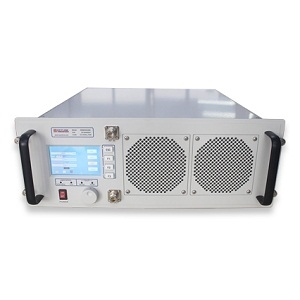 This 100 watt SSPA provides a gain of over 50 dB and is based on GaN technology. It provides excellent power density, high efficiency, low distortion and a wide dynamic range. The unit incorporates a universal voltage power supply and a built-in forced air-cooling system. This amplifier can be used for CW, AM, and FM modulation types and has front panel control from where the gain and other parameters can be adjusted.